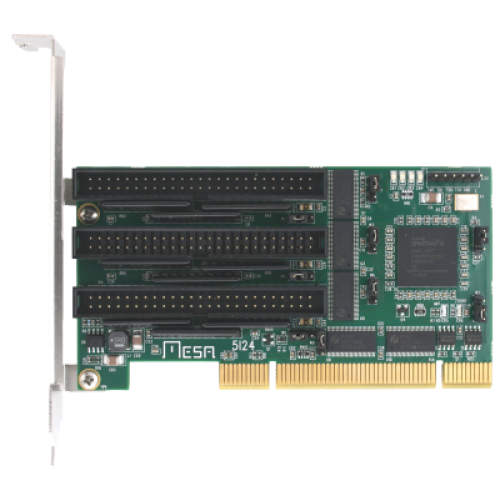 The MESA 5I24 is a low cost, general purpose, FPGA based programmable I/O card for the PCI bus. The 5I24 is a low profile PCI card (available with low profile and standard brackets, standard profile bracket shown here) Dual FPGA configuration EEPROMs allow simple recovery from programming mistakes. Firmware modules are provided for hardware step generation, quadrature encoder counting, PWM generation, digital I/O, Smart Serial remote I/O, BISS, SSI, SPI, UART interfaces and more. All motion control firmware is open source and easily modified to support new functions or different mixes of functions. All I/O bits are 5V tolerant and can sink 24 mA. All I/O pins support 3.3V LVDS signaling. Socketed pullup resistors are provided for all pins so that they may be connected directly to opto-isolators, contacts etc. 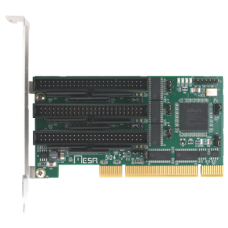 The 5I24 has 72 I/O bits available on three 50 pin connectors, all connectors use I/O module rack compatible pinouts and are compatible with all Mesa 50 pin FPGA daughtercards.